Get your FREE Staffordshire Enjoy Card, and take advantage of exclusive special offers, discounts and promotions from some of Staffordshire’s top attractions, restaurants and shops. For even more ideas, please visit Where can we go.com for up to date information on events etc near Denstone. A fun packed day for children and adults. The gardens are spectacular and a quiet retreat from the action on the rides. Perfect, if you’re not as keen as your friends or family on roller coasters. Much investment has been made over the past few months to make it a world-wide attraction. The new-look gardens have matured into some of the finest in Britain. 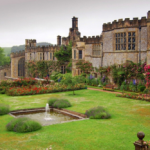 Alan Titchmarsh called them “one of the UK’s must-see gardens“. Home to a fabulous collection of wire fairy sculptures. This also includes the Monkey Forest A great day out for the family where friendly monkeys wander free. An amazing Victorian Garden created by Darwin’s contemporary, James Bateman. A wonderful collections of plants. Museum of Childhood. Discover two contrasting experiences sitting side by side. Sudbury Hall, the country home of the Lord Vernon, offers the delight of 17th-century craftsmanship. Watch your children discover something new, or relive nostalgic memories by exploring the childhoods of times gone by. Did you know Leek Town was the centre for embroidery? In 1879 the Leek Embroidery Society was set up by Elizabeth Wardle , wife of Sir Thomas Wardle, a silk importer. They also used designs from William Morris who lived nearby. Some of his designs can also be seen in the local churches in Leek. A market town with small shops, supermarkets: Waitrose, Tesco, Lidl, Asda, Iceland. Market day Wednesdays 10 till1 pm Ashbourne 10 minutes drive, on the edge of the Peak district. A pretty market town with antique shops, artisan cafes and boutiques. Market days on Thursdays and Saturdays. There’s also a Makers’ Market on the 4th Saturday of each month. Hire a Canal Boat for the day near Leek on the Caldon Canal. “Joshua” is a 35foot day boat will take up to 10 people. 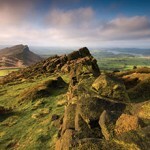 We’re perfectly positioned for walking in the Staffordshire Roaches , Peak District and the Staffordshire Moorlands. Here’s a collection of local walks around the Staffordshire Moorlands. 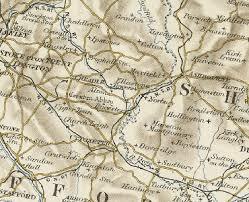 Alternatively try the walk around the nearby village of Ellastone, on the way to Ashbourne. We also have a special walk available at reception if you would like to ask Alison or Joseph. It does involve a little bit of road walking at the beginning. Treasure Trails are a hugely popular way of exploring the sights in the area. Find a trail in Alton or Rocester villages. We are blessed with a disused railway line that runs right past Heywood hall. 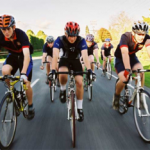 For a fantastic, level route, jump on your bike and cycle all the way to Oakamoor. Stop at the Ramblers Retreat for a late breakfast, lunch or afternoon tea, then cycle back. A great way to spend the day. Alternatively meander off the railway line and cycle your way around the countryside, taking in the pretty views of the Churnet Valley. The Equestrian Centre offers riding lessons and hacking either privately or as a group. They have their own land where they adventure out at a pace to suit the riders. The Ramblers retreat, open for morning coffee, lunch and afternoon tea. This is near Oakamoor along the disused railway line, about 1 hours walk. Tel 01538 702530. Recommended in the good food guide. Within walking distance. Great for Breakfast, morning coffee, lunch and afternoon tea. And a beautiful farm shop stocking high quality meat, sausages and poultry, cheese, fruit and vegetables. Will deliver freshly prepared meals for you to heat up and enjoy in the comfort of your suite. Prices available on the website. Please allow 24 hours notice. Are you looking for a professional hairdresser and beauty salon? 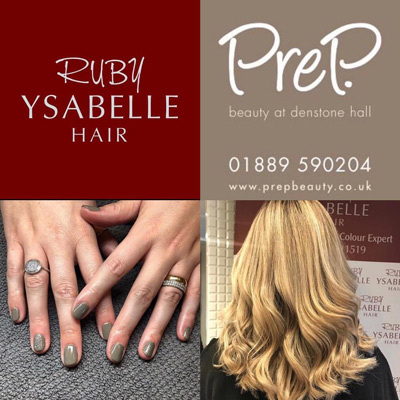 A few paces just opposite Heywood hall we are so lucky to have 2 very professional salons right next door to each other. Should you wish to receive more information please contact us. Fancy stretching out those tired muscles after a day walking around Alton Towers theme park, or wondering along the Staffordshire Way? As a Body Control Pilates Certified Teacher I can organise a session of Pilates for individual tuition or a group class at Heywood Hall. Just ask Alison for more details. If you prefer to indulge your sense of taste, how about spending the morning making chocolates! About 30 minutes from Heywood Hall why not try a Chocolate Heaven Workshop (for groups of minimum 8) where you can enjoy a day making chocolates guided by award winning chocolatiers. Sessions last about 3 hours. Please visit the website The Bittersweet Chocolate Co. for more information. 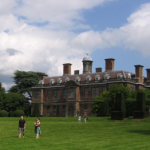 Sudbury Hall, the country home of the Lords Vernon, offers a delight of 17th-century craftsmanship, featuring exquisite plasterwork, wood carvings and classical story-based murals. Be amazed by the grandeur of the Great Staircase, Long Gallery and the captivating story which the house tells, brought to life by their knowledgeable volunteers and guides. 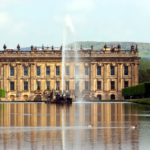 You can admire the splendour of the Chatsworth House, explore the garden, meet the animals in the farmyard, enjoy an afternoon tea and shopping in the stables or take a trip to the award winning Chatsworth Estate Farm Shop in Pilsley. 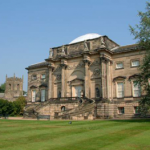 In addition they have a busy events programme including the annual International Horse Trials, Country Fair and Christmas market, as well as a brand new event for 2015, Chatsworth Festival – Art Out Loud. They are hosting many exciting exhibitions throughout the year from contemporary sculpture in the garden to Old Master Drawings in the house. There’s sure to be something for everyone to enjoy at Chatsworth this year. On Cannock Chase, now owned by the National Trust. The estate belonged to Lord Lichfield and has a working museum, servants quarters, a farm, mill and a train, as well as craft workshops. Set in 900 acres of parkland. Breath-taking! 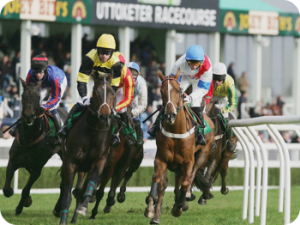 Uttoxeter Racecourse, located on the Staffordshire/Derbyshire border, is set in spectacular rural surroundings and offers one of the best dual tracks in the country. Steeped in history, they’ve been home to the Midlands Grand National since 1969 and host meetings all year round. Set over 120 acres Whiston Hall is one of the most beautiful golf club in Staffordshire. 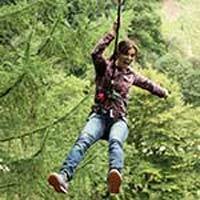 Situated only 4.3 miles from one of the greatest theme parks, Alton Towers. Why not come up for a round of golf and afterwards you can enjoy a few drinks sitting on the benches enjoying the beautiful view of Staffordshire. 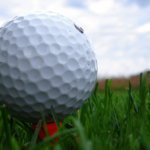 Uttoxeter Golf Course is undoubtedly one of the country’s best kept secrets. With its small greens and tight lines, the course is a fine test of golf for the low handicapper whilst providing the high handicapped player with a variety of options at each hole.Excellent putting surfaces and manicured fairways, uniform rough and extensive views across the Dove Valley to the rolling hills of Staffordshire and Derbyshire all collude to intensify the sheer joy of just being there. The fly fishing on offer from ABAS is some of the best available in the UK. From fishing small streams like the Manifold for big wild brown trout to utilising modern nymph angling techniques for grayling on the lowland Dove, Derbyshire really does offer the fly angler everything they could ask for. This breadth of exciting and engaging challenges is open through the year to anglers as the grayling fishing during the autumn and winter is of very high quality. Because of the quality and accessibility of the river fishing in Derbyshire the ABAS operates exclusively on running water for wild fish. If you are an experienced game angler but have never fished rivers before then ABAS provides you with a great opportunity to step in to the world of wild game angling – be warned though you may never go back to still water! Our home beat is a stunning stretch of the river Dove at Rocester, close to Denstone near the town of Uttoxeter. This stretch is part of a small and exclusive fly fishing only syndicate and one that sees very little angling pressure. During the whole season the hatches of Iron Blue duns, Blue Winged Olives and Sedges here are both prolific and consistent, as are the evening spinner falls and as such the dry fly fishing here is a match for any other freestone river in the UK. The water really comes alive for the Mayfly hatch from the third week of May until nearly the end of June and sometimes even beyond. As a more lowland area of Derbyshire this stretch of the river lends itself perfectly to anglers looking to hone their skills as the water is small enough to be intimate without ever feeling awkward or intimidating. Andy will pick you up from Heywood Hall and take you for your fishing experience. Contact Andy for prices and more information . Doveridge Clay Sports is one of the very few Premier Plus Shooting Grounds in the country which offers a wide variety of all clay shooting disciplines. Don’t worry if you’ve never tried it before, our in depth clay lessons will ensure you have all the skills to develop into a confident shooter. 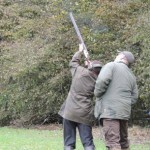 On your shooting lessons you will meet one of our expert instructors, who will take you to one of our clay shooting stands and then here you will be taught how to hold, load and hit clay targets. Our expert instructors are on hand to help you step of the way, and if you’re worried about recoil, don’t be! Our dedicated teachers are highly experienced in making your lesson stress free and enjoyable. Paintballing, Quad Bikes, 4x4 and more! 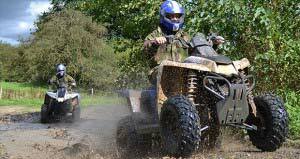 Ashcroft Park and National Paintball Games provide the very best in UK Corporate Events, Country Pursuits & Outdoor Team Building Activities in Staffordshire, Derbyshire and the Midlands. Based at Cannock Chase in Staffordshire, you’re in an area of outstanding natural beauty. Their Tree Top Adventure takes Cannock Chase’s breathtaking scenery, a smattering of tree-top high wires, crossings and wind-in-your-face zip wires. It’s a proven recipe that never fails. Their tree based High Ropes Adventure Course, set within the tranquil 725 acre grounds of Trentham Estate is a truly spectacular journey. Aerial Extreme is ideally suited for everyone, and can cater for groups and birthday parties. 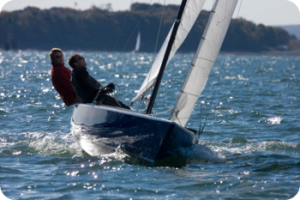 We’re close by a number of watersport centres. 45 minutes drive. Over 500 animals, 150 species, daily talks about animals, and events organised during school holidays. Amerton Farm : Ideal for younger ones with cows, Pigs, Horses & Ponies, Sheep, Alpacas, Chickens and Ducks which are all housed in a purpose built area. There is also a cafe and shop selling local produce. 20 minutes drive from Heywood Hall. It’s first motorcycle race took place on Whit Monday 1931 on the narrow lanes of the Donington Hall Estate. 1933 the track was widened, made permanent and became a venue for Grand Prix car racing. 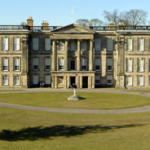 Heywood Hall lies close to the Staffordshire and Derbyshire county borders and not far from the popular towns of Ashbourne and Uttoxeter which provide excellent shopping and leisure facilities. A huge advantage to the village of Denstone is its location for fast access to major road networks including M1, M6, M42, and M40. These are reached via the modern A50 dual carriageway, only 4 miles distant and is the main link to the M6 in the west and M1 in the east. Only about 35 minutes to each. The A50 also links to the A38 dual carriageway route to Birmingham. The nearest rail station is only a 12 minute drive. 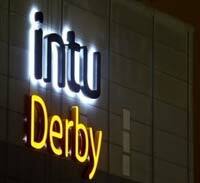 For as little as £7.50 and a 26 minute ride, you can spend a day in Derby Westfield or the even larger shopping destination of Nottingham, from £8.60. 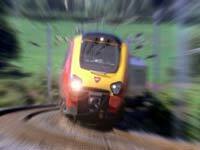 From Stafford there is a fast mainline rail service to London ( 1 hour 25 minutes). London from Uttoxeter Station is 2 hours 16 minutes. Here in Denstone there is wealth of history to discover. There are many unusual historical places, some of which may even have a connection to your family. Staffordshire County Council has a Start Your Search website to help you. Just remember to bring with you proof of identity and address, when visiting the records office. There are record offices at Stafford, Stoke and Lichfield, plus the William Salt Library. Staffordshire Past Track gives a brief history of places within Staffordshire and has pictures of buildings no longer standing. Heywood Hall is an imposing substantial Victorian family home. The largest house in the village, with over 8,000 square feet of accommodation covering 2/3rds of an acre. It has been the family home of Alison & Joseph Petitjean and their two boys for the past six years. It was built in 1885 as the residence of the Provost, for the local Woodard Independent Schools, the closest of which, Denstone College, is a short walk along College Road. The builder of Heywood hall, George Percival Heywood, was also one of the original patrons of Denstone College, gifting the land and funds to complete the magnificent Gothic buildings which include Denstone College, the Church, Vicarage, the Curates House, School Room and Old School building which still dominate the village today. Did you know that Denstone is widely known for its delicious damsons. In May the blossom is spectacular. The fruit was sent to Lancashire for use in dyeing materials. It also makes wonderful jam. Although there are records of Denstone going back to Norman Times, it was not until the arrival of Sir Thomas Percival Heywood in 1840 that the village was really established. Prior to this time, Denstone was an agricultural area bounded by the river Churnet and consisting of sparsely populated, scattered Hamlets. The Heywoods were a wealthy banking family from Manchester and Sir Thomas had a wish to become squire of his own village and Parish. To this end he employed one of the finest architects of the day, George Edmund Street, a leader in Victorian Gothic Revival, to build Denstone Church. The Church was completed in 1862 and Sir Thomas then had the original village school built in 1870, the Provost’s house, now Heywood Hall in 1885, and the Church Room in 1890. 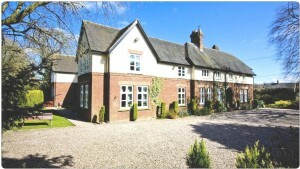 The school is now a private dwelling, and the Church room has recently been renovated and is now a private house. The fountain was erected in in 1900 in memory of Sir Thomas as part of the village water supply piped from a nearby spring. Sir Thomas was instrumental in founding Denstone College, which opened in 1873. The major housing developments in Denstone have taken place in the last 50 years. Denstone has been transformed from a small village of about 50 dwellings, firmly based on agriculture, to a thriving community today with 250 dwellings within the village and another 100 approximately in the hamlets of Stubwood, Quixhill and Prestwood, which are part of the Parish. Cinema, Ice Skating and bowling at ST14 8AZ tel 01889 566644 www.cinebowl.co.uk . 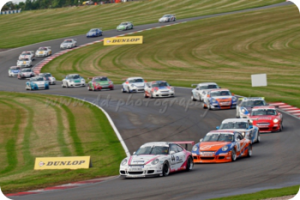 Look for special offer vouchers if you book in advance. Mill view surgery, Rocester 1 mile.